We're giving away free books!!! Like “The Ruth Experience” page on Facebook. 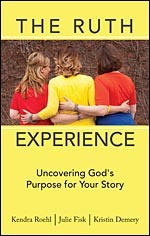 Share “The Ruth Experience” page with your friends on Facebook. Sign up to follow our blog. Three different ways to enter - you only need to pick one - and your name will be entered in the drawing. We will randomly pick two winners on Monday, April 1st and announce them that same day. And no, this is not an April Fool's Day prank! For anyone who does not win, no worries, our book is available for purchase…and here’s the really cool part: Orders placed through July 1st, 2013, we will be giving 50 percent of our proceeds to support El Refuge, a safe haven for young people who have been transformed by Christ's love in Panama City, Panama. That’s right, 50% of the proceeds of every book we sell is going to support and empower girls and women in Panama who may have been abused, disregarded, or voiceless (check out week two of our Lent Remixed Series for more information on Panama)…which is really what The Ruth Experience is all about, anyway. Sharing our stories, building our faith, and glorifying God - all at the same time!